This is an oft recommended ink, and I can understand why. It is a very standard looking medium blue with a hint of purple. There are other similar colors such as Waterman Florida Blue, J. Herbin Eclat de Saphir and Quink Washable Blue. But, what this ink has that those don’t is higher saturation. 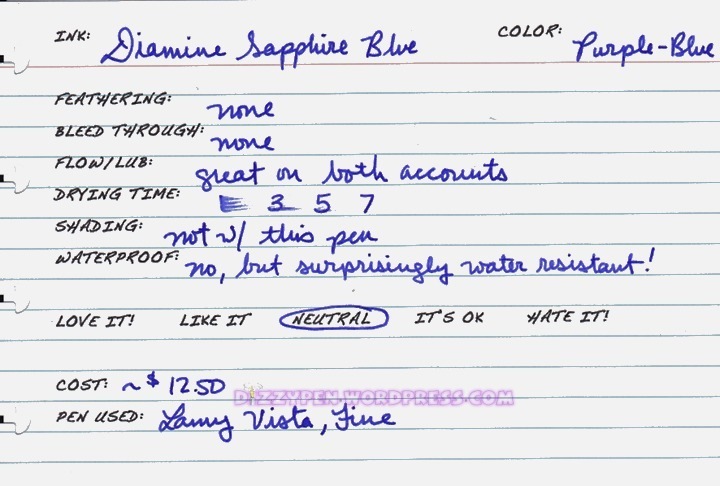 That fact makes this my favorite purplish blue ink of the bunch. Now, last week I reviewed Noodler’s Baystate Blue. In my opinion, this is the closest BSB sub that I have seen. Of course it isn’t perfect. When you are trying to come up with BSB subs there are certain concessions that must be made. Firstly, you aren’t going to be able to get that trademark vibrancy that BSB is known for. There really aren’t any other inks on the market that will glow like BSB, so if that is the most important characteristic to you, then you might as well stick with BSB. Secondly, you aren’t going to get the same level of waterproofness from any sub. You can get some water resistance, but not 100% waterproofness. In my opinion, Sapphire Blue is a very similar blue with a bit more purple thanBSB. It is not as vibrant, but it still jumps off the page. It is almost as saturated. It has a pretty high level of water-resistance. This sample was sent to me by the good folks at Diamine. I am not otherwise affiliated with them.